Each time I reflect on a service I try to give emphasis to a different part because the restriction in the length means I can't pay proper attention to every part every time. Rev. John began by drawing our attention to God’s support for us in everything we do or in which we are involved. Life throws up many obstacles, sometimes one after another, and it is only with God’s help that we can continue. Hymn TIS 123 “Be still my soul: The Lord is on your side”. With this hymn the theme continued. However, it speaks of keeping our hope in dark times, as though they are a contradiction in a faithful life. But life happens, whether we walk with God or not. But if we keep our hand in God’s hand, the dark times will be easier to live through. give our lives wholly to God, we get a much better deal than if we try to keep control of all or part of it ourselves. merciful God, wash away the injuries we have inflicted upon one another. When we have made lives bitter through word or deed, forgive us in your mercy. When we have ignored the plight of others through ignorance or wilful neglect, reclaim us in your grace. Restore us to your path of love and compassion, that we may bathe in the waters of your compassion and love. Amen. If it had not been the Lord who was on our side, the weight of the world would have crushed us by now. If it had not been the Lord who was on our side, the weight of our lives would have drowned us by now. Thanks be to God who is on our side, and who rescues us from forces that seek our undoing. In Christ Jesus, we are set free and made whole again. 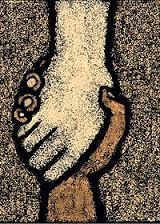 Having made our peace with God, we offered the sign of peace to each other. It always interests me that we label this part of the service “the offering” when many people offer much more to the building of God’s kingdom in other ways than they do through the collection plate. Our all. That's all God is asking for. Hymn TIS 467: “I am the church! You are the church!” It's good to remember this. It prevents that “They should” mentality. Carolyn began this section of the service with readings from Exodus 1:8-2:10; Romans 12:1-8; and Matthew16: 13-20. Exodus 1:8 The first reading is the well known story of how Moses survived a purge of Hebrew baby boys and came to be treated as the son of the Pharaoh’s daughter. 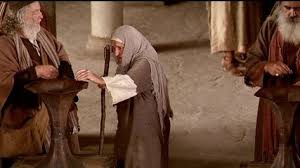 Moses’ mother trusted God to protect her and her son. This first sentence really covered all that followed. Let God steer. It's safer and more sensible. ‘But who do you say that I am?’ Time to show where we stand. I have selected a few sentences out of John’s sermon. Today he delivered a very complex theological message about why Jesus would want to keep his identity a secret, but I have chosen just one thought that stood out for me. Peter is the first disciple to recognize that Jesus is the Messiah. He is the first to discover that this man he knows so well is the one anointed by God. In this moment Peter stands for the whole church again. With the outcome that we too shine as the light of Christ and we will not keep the Messiah a secret. Why! Because the world where we spend our days, still waits for him and that world is dying to meet him – and they will meet him through us. Remember the thoughts from the beginning of the service that Life is tough and we can only get through it with God by our side. Hymn TIS 440: “Christ from whom all blessings flow” The blessings aren't just a way of making it through life. We become more like Christ; We become part of his body. We become what we were created to be. Music to lead us to prayer while we thought our own thoughts. Intercessory Prayers led by Wendy Wendy addressed Jesus Christ, Son of the Living God, asking that our prayers be heard. She called for safety and security everywhere but particularly for those people living in the midst of war. She asked that God change leaders who seek to dominate that they will embrace love; that people everywhere will acknowledge Jesus Christ as Saviour and proclaim his gospel. She asked that the Spirit will lead us in love for God and each other. We joined in the Lord’s Prayer. Hymn TIS 446: “Glorious things of you are spoken” This hymn summed up all the thoughts we had had so far. When God restored the fortunes of Zion, the Israelites wandered home as if in a dream. Let us be a people who wander in our dreams. Wander amongst God’s marvellous creation! Wonder at the amazing things God has done! Do not worry about your life, today or tomorrow. Trust that God values us even more greatly than birds and flowers, no matter how beautiful they may be. Know that God treasures us completely, and gives us all that we will ever need. Come with hearts overflowing in gratitude. God has done great things for us. Be glad and rejoice. We rejoice in God’s gifts. Sing praises of joy. Our mouths are filled with laughter. Shout with thanksgiving, in sunshine and rain. Praise God for our lives, for harvest and food. Hymn TIS 560:“All my hope on God is founded;” Echoing the words above. Giver of life, for sunshine and showers, we give you thanks; for food and drink, we give you praise; for clothing and shelter, we bestow our gratitude. Gather our worries and our burdens this day, and shelter us from fear and despair. Help us rest assured in your arms, knowing that your loving care is enough. It is enough. It is enough. Amen. God not only delivers the things of this world but the things of God’s world. that we may reap a harvest of joy; replace our selfish dreams of wealth and prestige, with gratitude for what we have, that we may find contentment in life. for you have done great things for us, turning our tears into shouts of joy. Through Christ, God’s love has done great things for us. Through Christ, God’s grace restores our life and makes us whole once more. Share with one another signs of peace and love. Show Christ to one another, that we may be reminded of the peace that passes all understanding. John’s Prayer reminded us to be glad and joyful for all the good things we are given. Hymn TIS 555: “Put all your trust in God” If we put our trust and ourselves, including our plans, in God’s hands and stay alert for his voice, then our path will be true. Rev. John wrote about various approaches to giving he had encountered or had heard of. At Marsden Road he said he had encountered great generosity and so have I. Not just generosity with money but generosity with both time and energy. I would agree with the Rev. John that in the Western World we all have trouble coming to terms with sacrificial giving. Not many of us are able to bring ourselves to the level of sacrifice of Mother Teresa, whom Rev. John refers to. But many give up much for the benefit of others. There are many ways of being sacrificial. Some go without sleep for a sick friend or relative. But I would agree with that in the West, our giving normally involves giving up luxuries. Not so many visits to the theatre; not so many holidays away; not so many meals in a restaurant, or whatever it is that is a luxury for us. It's worth reflecting upon - in Jesus name. Hymn TIS 589: “Jesus calls us! O’er the tumult” It would be a better place if we could all ignore the trivial and keep our focus on God’s plan for us. Hymn TIS 143: “Immortal, Invisible, God Only Wise” The only one of whom we can depend. Benediction Go forth with shouts of joy. Proclaim the greatness of God! Be glad and rejoice in Christ’s care. Trust the promises of God! As you go in Trust may the blessing of that same God, Creator, Redeemer and Giver of Life remain with you always. As for me, I shall behold your face. . .. When I awake I shall be satisfied, beholding your likeness. Why have you come this morning? We have come to encounter the Holy One. You know you’ll never be the same if you do. We have come to wrestle with our faith, our doubts, and even our convictions. Then come; let us venture into this time of worship and prepare to encounter God face to face. Hymn TIS 578: “How firm a foundation, you people of God” God is our rock. Everything else and everyone else can fail us but God, we can always depend on. Always. O God of night-time visits and daylight assurance, we come to this time of worship to wrestle with who we are, and who you call us to be. Search our hearts and know us thoroughly. We long to meet you face to face, even if the encounter leaves us forever changed. With open ears and ready hearts, touch us with your words and transform us with your presence. Amen. God who sees, knows, and touches us, we have many things in our lives that we are not proud of. We are scared to come before you with all that we are. We are frightened that you will judge us and find us wanting. We are afraid of your rejection or abandonment. Forgive our shortcomings, large and small. Reassure us that you are always present with us, that you always love us and want only the best for us. Forgive our fearful reluctance to open ourselves fully to an encounter with your holy presence. Wrestle with us, touch us, and awaken us to your love— a love that never lets us go. Meet us face to face, that we may be forever changed. Amen. Dawn comes, and we will see God face to face. We will behold the face of unconditional love. In this meeting, we will understand the depth of God’s reassuring forgiveness. And in this understanding, we will be changed for good. A flash of brilliant light, a mushroom cloud rises. Nothing will ever be the same. May wars cease as we work to be peacemakers and not merely peace hopers. Touch us, O God, and we will never be the same. In life and in death we are not alone. In gratitude for the gift of eternal life, let us greet one another with signs of peace. The peace of Christ be with you. of peace and unity. Amen. Hymn TIS 138: “Eternal Father, strong to save” The theme continues. We can rest in God’s eternal arms, in full security that we will be cared for as none other can care for us. I have included the service so far, almost as Rev. John delivered it today, because everything that was said and sung touched my heart so poignantly and I thought it would do the same for those who read it. We continued on with the Service of Communion. This never fails to quieten my soul. Whether it be the mighty prayers, the historical events remembered or the reverence of the people celebrating the service, I am stilled. Somehow, there are so many centres to this service. Jesus Christ and his willingness to turn his face to Jerusalem is clearly at the centre of our attention. The effect of that sacrifice on our lives and then as we are offered the bread and the wine, each of us is given the impression that it is just for us. Hallelujah! The Readings: Genesis 32:22-31. Romans 9: 1-8. Matthew 14: 13-21 brought to us by Lyn. The first reading about a man wrestling with God no doubt has a traditional meaning and message. However, as one who has wrestled with God, I can say that it leaves a mark like the limp of the man in this reading, that never goes away. No matter how things around me are or how much I would like to sulk in a corner because things aren't as I would like them, I can't say that I don't know my maker. I am stuck. To take Paul's message and place it in a modern context is difficult because there are so many possibilities. I think the message that is coming to me is to let God run his world. Do as we see God guiding us to do and then leave the rest to God. And the third reading for me says that I (and each of us) have been given resources. Use them to serve others. Preaching of the Word - God is Good. * After a long and exhausting day, Jesus’ disciples come to him and suggest that the crowds be sent away so that they may go into the villages and buy food. *Jesus tells them in no uncertain terms that it is their job to help feed those who are hungry. *God can raise up amongst us what we need. And in those words I heard God’s voice. Hymn TIS 530: “Now let us from this table rise” The words that leapt out to me were ‘renewed in body, mind and soul’. Grahame played to provide background for our thoughts and prayers. Rev. John prayed to God who is steadfast in love, giving thanks for answered prayer. He continued, bringing before our God, all those affected by war, terrorism, disaster and famine. He prayed for the homeless, the addicted and everyone afflicted in any way, that leaders will see fit to dispense mercy and justice to right wrongs that create the circumstances in which all these terrible evils flourish. He prayed for those who are close to us and that our gifts will be used for those in need. He prayed that we will welcome anew all those who come to the table with us, that we will provide the nourishment of fellowship and friendship. We then joined in The Lord’s Prayer. Hymn TIS 201: “King of glory, King of peace”. To love may never cease. Amen to that. Go forth, knowing that God has heard our cry and will give us the strength to follow God’s call. Go forth to touch the lives of others, as our lives have been touched by God. Go and be the face of God to a world that so desperately needs the loving, affirming face of God. And may the wrestling God be with you always. Amen. Hymn TIS 778: “Shalom to you now” May God grant you every good thing. Amen. For the last few weeks I have been hampered in my ability to get things done, in any sphere, by a nasty cold which fogged up my brain. However, in the little reading I did get done, there was a discussion about our experience of the worship service being one that should lead us to live a life more like that of Jesus. But does it? Of course, there are those occasions when we are challenged by the Spirit to examine our lives and in doing that, we have an opportunity to be more like Jesus, but how many of us go to a service with that intention? Many attend worship services in the hope of being uplifted or inspired to face the week ahead with purpose. A good intention, but possibly not one that should be our first. Others are less self-oriented and go to church to worship, glorify and give thanks to our Maker, the source of all that is good. That is getting close to the best reason for being there but if we could follow through that intention with looking for the effect that worship could have, that is, to be more like Jesus, I think we would have nailed it. For some, the idea of being more like Jesus might seem so far out of reach, but we have to start somewhere and many of us have been fortunate enough to meet people who, because they started “somewhere” and continued to yield to the working of the Spirit are noticeably more like Jesus now. The first hymn reflected the purpose often seen as the highest one in coming to worship. Holy One, your kingdom always takes us by surprise— like a mustard seed growing into a great shrub where the birds of the air can build their nests; like a treasure hidden in a field, or a pearl of great price. May we desire your kingdom more than we value worldly things, through Christ, who shows us the way. Amen. “Nothing can separate us from the love of God: Not death, nor life, nor angels, nor rulers, nor things present, nor things to come. No power on heaven or under the earth can separate us from the love of Christ: Not height, nor depth, nor anything else in all creation.” That being the case, then, as we walk with God, we become more like Jesus because that example is constantly by our side. The offering is a time when we show ourselves to be like Jesus - giving for people: giving for the sake of God and for other people. None of this that we give may come back to us but the giving itself changes us for good - to be more like Jesus. All these readings carry a message but the one John focussed on was the one from Romans. 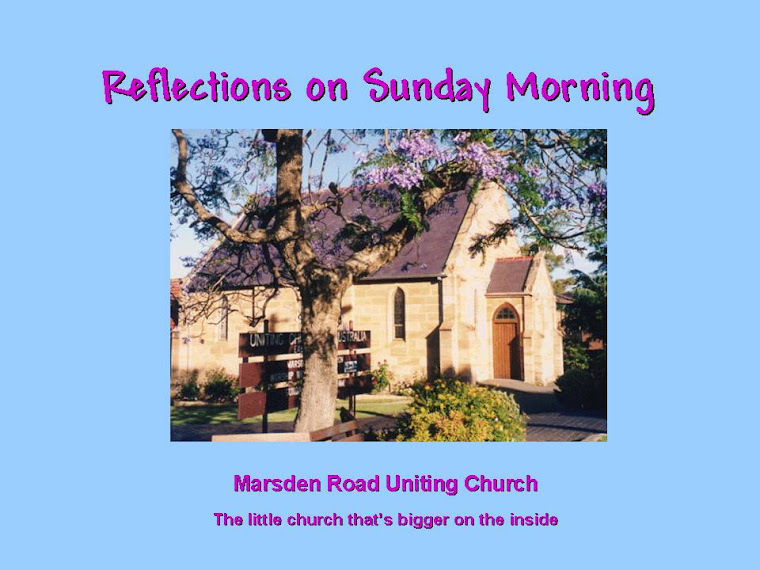 John spoke of a recent personal experience where he had to draw deep from within to get through the time and showed how God lifts us up at such times. My own thought is that some burdens are so heavy that we can only act as Jesus would in those situations if we are lifted up and carried through them by God. (Where) 'God’s grace breaks into our lives most powerfully. Hymn TIS 547: “Be Thou My Vision” The message is clear. Music to lead us to prayer followed while we all sat in our own silence. This is a time when, regardless of the details of the prayer each week, we pray that we and all other people, will act more like Jesus to make this world one of welcome, safety and warmth for everyone. Like treasure hidden in a field, Christ offers us the kingdom of God. Like a pearl of great price, Christ offers us the kingdom of heaven. All things work together for good for those who wait for God. 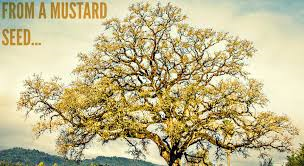 Like a mustard seed that grows into a great shrub, Christ offers us the realm of God’s blessing. All things work together for good for those who abide in God’s Spirit. And may the Holy Spirit fill and inspire you with the wonderful knowledge that nothing is able to separate you from the love of God in Jesus Christ. Hymn TIS 780: “May the light come into your eyes”. Amen to that, and through this may we be made more like Jesus.